Darth Raider debuts his first review on LatinoGamer.com! Two years after Hot Pursuit Criterion games brought us Need for Speed Most Wanted in another somewhat-remake of the NFS title that released in 2005. The new Most Wanted title differed from Black Box’s The Run in that it had a story to the game. 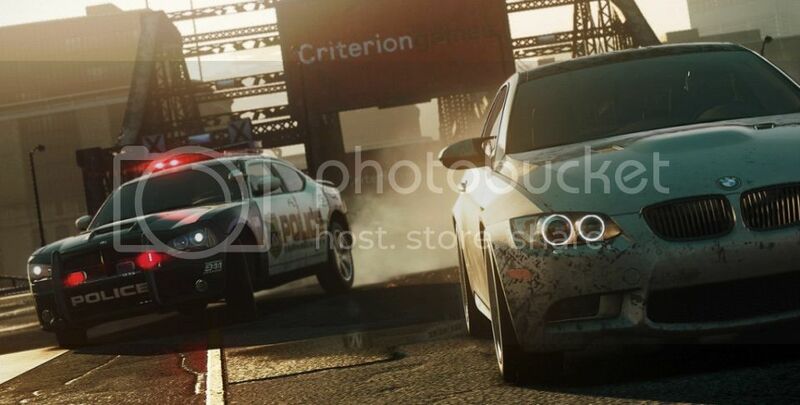 In Most Wanted Criterion went back to a more traditional NFS game that has usually never had any sort of plot. Having no story to go by is not always a bad thing and in a racing game we can live without a story; all we really need is awesome cars we could probably never afford and a large free roam map where we can cause chaos. In the single player campaign we are left to win races, escape the cops, and do speed runs for more experience points which unlock things for us to customize our car and ultimately be able to unlock races against the top 10 most wanted drivers in the game. Aside from these top 10 cars all the other cars are available from the very beginning of the game, except that we are left with finding the cars hidden all over the city of Fairhaven. From the very beginning of the game you are presented with a quick tutorial of what to do and how to use their new menu, which is your guide to all the races, unlocks, and car selection. This menu can be accessed at any point while you are playing and is controlled by the D-Pad. It is a bit confusing to use at first but after a while I had mastered this new menu. Most Wanted brings different feels for all the cars. A Challenger SRT drives and feels like a Challenger SRT. You can really feel the drag that the muscle cars give as opposed to the imports. Although this game is not a racing simulator you can still feel the differences between all the cars; this gives each car more of a personality. Other than Shift, Shift 2, and Pro Street, I had never felt this sort of difference from car to car in previous NFS titles, which is something that has brought a better experience to arcade racing. The way drifting works in Most Wanted is how it’s always been in all the past racing games. You tap the brake once and hit the gas while you’re making that turn. In Most Wanted one thing has changed though: drifting has become a little harder to control. Normally, in arcade racers, it is easy to control the drift but it has become slightly more challenging in Most Wanted. In a way it’s a good thing because the more experienced drivers can enjoy this challenge and be able to beat out other drivers during turns but for those casual gamers it might become a bit of an annoyance not being to bust a drift on every turn in a way they could only imagine in their head. With whatever cars you have at your disposal you can try to win all the races in the D-Pad menu and unlock as much as you can for your car; surprisingly, once you upgrade your car, it’s at its max and can keep up with some of the more exotic cars in their stock form. This does not go for every car, though, only for what one could call the middle weight cars like a Camaro ZL1 or a Lamborghini Gallardo. Every race event in the game has a very cool and artistic cutscene to it which one could admire. When you see the first cutscene you might be confused at first why the sky is raining cop cars but after the second you realize the art direction Criterion was going for. 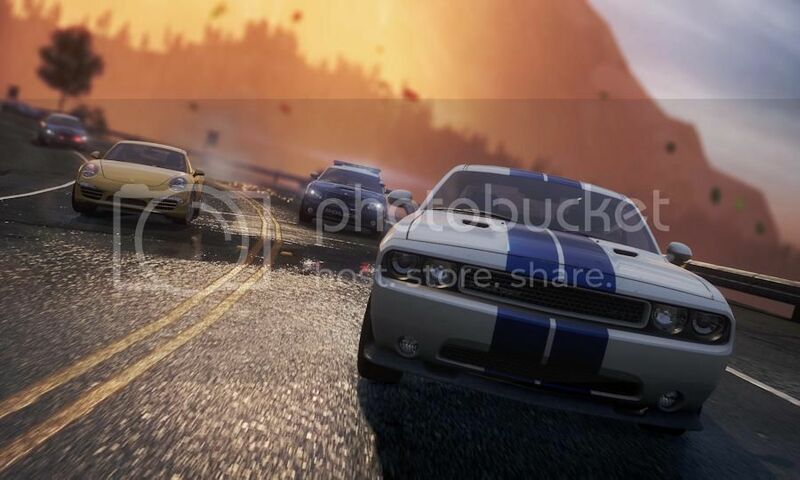 Also, the 10 most wanted cars have some beautiful cutscenes of their own. Going off road became an addiction for me since there are many off road spots where you can drift into donuts or juke the cops into crashing. There are different tires you can unlock in the game and some of the tires are good for off-roading. Not every car works well off road just as not every car would work well off road in real life. This doesn’t mean that you won’t be able to drive your Bugatti off road it just means that you can feel the difference between a car that can do off-roading well like the Mustang Boss as opposed to a Bugatti going off road. No matter where you are in Fairhaven you are always near an off road location and no matter how beat up you got your car you are always near a gas station—all you do is drive through it and your car is completely fixed and hooked up with a new paint job. The police in Most Wanted aren’t the best at what they do in the world of gaming, but nevertheless still give some excitement over getting chased. The more chaos you create in the presence of a law enforcer the higher your Wanted Level will be. At first you are chased by your average police cruiser but once you get your Wanted Level a bit higher after ramming several cruisers you begin getting chased by cop Charger SRTs and Corvette ZR1s. The car you are driving and how skilled of a driver you are determines whether you are going to escape the cops, but ultimately you have to smoke the cops behind you and be out of the range zone in the map before your Wanted Level begins to drop. During these chases cops will try to get you to step on their spike strips and try to stop you with roadblocks of either cop Ford Explorers or SWAT vans. When you figure out that the cops become stupid once you go offroad you begin to notice how confused this A.I. becomes once you decide to do donuts around the cops. In a big open field you can literally do donuts for a good 10minutes at Wanted Level 6 (highest Wanted Level) without getting scratched by a cop. In a way it is kind of a disappointment but it can also be fun just busting donuts around 12 confused cop cars. One thing that got me sad was the absence of the Ghetto Bird (police helicopter), it worked well in Hot Pursuit and I am a bit surprised it was taken out from Most Wanted. Before the game was released all the features that were put out there about the multiplayer made it seem like it would be the best racing multiplayer game of all time. Boy, were they wrong. It seemed good on paper, but once executed it was kind of a big mess. In multiplayer you are dropped off at a random spot in the map with 7 other players roaming the map. The creator of the room gets to pick the event the racers must compete in and once they pick the event all the drivers must meet up at the starting point for the race. In every single meet up I got to all the drivers are always ramming into each other causing the civilized drivers like myself to respawn every time someone decides to ram them. There are optional restrictions to the cars one can use during the race but in my experience people hardly ever put restrictions. What that means is that we have a race with new online players driving BMW M3s, Challenger SRTs, Porsches, and that one guy driving the Bugatti. All the experience points you earn in single player are also counted in multiplayer so the more points you have the more cars you have online. The cars you find in single player do not become available in multiplayer. One thing I did like about multiplayer is that you can customize your license plate with cool plates and whatever you want them to say as long as it all fits in the digits available. There are some challenges you can do online that unlock more images you can use to customize your plates. One thing that kind of surprised me was that I had to smash into 50 cars before I could unlock the color white on my Camaro ZL1. Seriously, I have to unlock paint online? And it doesn’t get any better because in online multiplayer there are NO cops whatsoever—how disappointing as this game is called Most Wanted and online you really don’t feel wanted at all. I don’t get why they wouldn’t have cops chasing you. They don’t even have the ability to let you play as the cops; in Hot Pursuit you could at least play as the cops but I don’t get why they would take a step backwards in their online modes. Overall the game is the best arcade racer out there regardless of the mayhem going on online. With awesome handling of the cars that give you the feel of what your car should feel like. All the unlocks for the cars are a step forward for arcade racing since other arcade racers don’t really let you customize your car at all. Most Wanted is a game that can teach you how to become a good gaming driver with its challenging drifting controls if you put some time and effort into spinning out of control several times while being pitted out by a cop cruiser. Although the online multiplayer is somewhat of a nice tasty pizza that was thrown into a chalk board that should have never happened I understand that on paper the idea of a free roam online multiplayer game would seem like a good idea, but in a way it was an experiment gone wrong. You can find yourself spending most of your time playing this game in single player either beating the top 10 most wanted or just messing with the clueless cops.